Whoosh! In the blink of an eye, a drab monk becomes a colorful court jester! He’s light on his feet, as he dazzles with his stunts and gets the crowd howling at his sight gags. This corporate entertainer is unlike any act you’ve seen before–and ideal entertainment for a convention, trade show, company sales meeting or holiday event. Alexander, King of Jesters, is ready to delight and amaze everyone in your organization. Alex the Jester offers extraordinary corporate event entertainment that combines the sleight of hand of a magician with the physical dexterity of a juggler and the comic wit of a comedian. Alex has a magical stage presence as the medieval court jester who stepped into a time machine and popped out into our mad 21st century world. He captivates his audience with the very best clean comedy that’s appropriate for all sensibilities while still maintaining a sophisticated, mature edge. Alexander offers a grab-bag of delights as an accomplished corporate performer. The magical gibberish language called grammelot. When Alexander speaks in this nonsensical language, your guests will be mesmerized by how he conveys his innermost feelings, from pride to embarrassment to shyness to being stark raving mad! No matter how wild he gets, he never speaks a word of English. This means that Alex is incapable of uttering a swear word or an inappropriate thought. He’s the ultimate in clean comedians, and has even appeared on prime time TV. But just because Alex the Jester is a family-friendly clean comedian, that doesn’t mean he’s missing an edge! Enjoy quality entertainment without the risk of stand-up comedians, where the language might become too racy, leaving more sensitive people embarrassed or possibly offended. The benefits of a comedian, juggler and a magician. 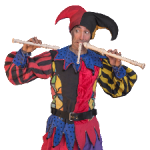 If you present a real live jester, you’ll be thanked by your guests for treating them to something refreshingly different. The jester really stands out among corporate entertainers! Everyone has seen the motley costume and curly boots on the ‘joker’ playing card. But how many people have seen a real one? A captivated audience that’s fully involved. Magicians and jugglers are often better at delivering clean comedy while holding people’s attention and getting everyone involved in the performance. Who doesn’t like magic or seeing a great trick? If you’ve never booked a magician or juggler, you’ll be in for a pleasant surprise. An entertaining court jester who’s light on his feet, spryly prancing about in curly boots. He’ll endear you with his wit, charm and consummate skill. He expertly plays his instruments, and he expertly plays his audience! After all, that’s what jesters do! Jesters have a long, noble tradition. A jester will fearlessly joke around with a senior executive of a company. He will not humiliate, but will gently goad him into cutting loose. Wouldn’t you love to see your CEO skipping around like a kindergartener? The flip side is that Alex makes heroes out of everyday people. The person who empties your wastebasket may be honored with a gold medal while a heroic anthem is played. But whether he’s joking with your company president or his latest hire, anyone who interacts with this funny performer will leave the stage looking happy and satisfied. 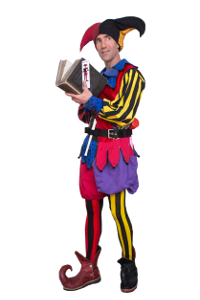 If you’re considering various corporate entertainment ideas that will appeal to a wide variety of individual tastes, Alex the Jester is ready to prance to the rescue in his jester’s hat and curly boots! Experience the best in corporate event entertainment — Massachusetts-based Alex the Jester!